Is this the next ice skating tour? Newest drink at the local watering hole? 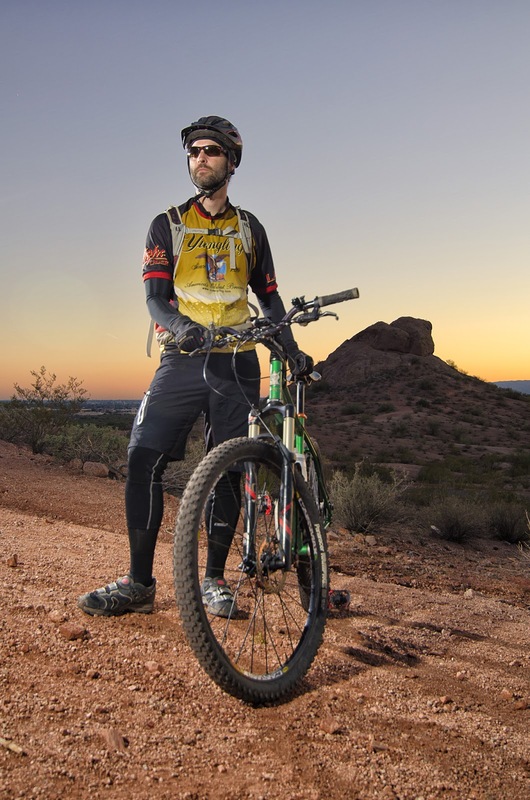 Nah, it's the annual fund raiser for the Arizona Trail held on the AZT southeast of Tucson, only this year the starting temps for the ride were somewhere around 22º! Brrrr. It's not that it doesn't get cold in AZ, it does. There's even downhill skiing here. We typically don't have to deal with frigid temps like that in the land of the cacti. I knew I'd get a good opportunity to try out my new winter riding gloves, aka the lobster mitts. Seron had to pull the plug due to knee issues, so I made the trip south solo. I actually arrived early enough to park in lot #1 - shocker. The shuttle buses filled up and we were off to the drop point down on Box Canyon Rd. 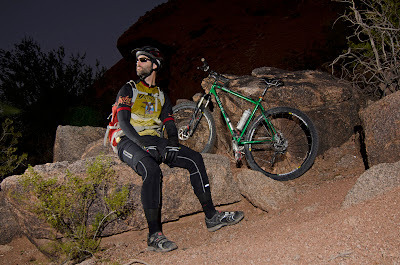 It would be a 39 mile point-to-point ride on some sweet AZT, at least when it's dry!! Yep, we rode the short bus! Thanks to Southwest Trekking for offering their services. Patches of snow at the start. Thankfully the sun was shining & the wind calm. There's about a mile of dirt road before the AZT turnoff, then the undulating climbing begins. People gathered their bikes quickly and took off, almost race-like, we were all eager to climb to get warm! I had plenty of layers on, felt comfortable, all was good. The trail through this part of AZ is truly stunning. One of two spots where I stopped for the sole purpose of taking a picture. Almost all of the north facing slopes in the shade had snow, albeit very thin, but it kept you aware. Last year Chris and I struggled through this section on the AZT300, I kept having flashbacks to the miserable riding conditions and all the hills I had to hike-a-bike. Thankfully, I was cruising along actually passing a few people here and there. One of the longer tougher climbs I was able to clean except for one quick stop to catch my breath. The longest stretch of snowy trail on the day. 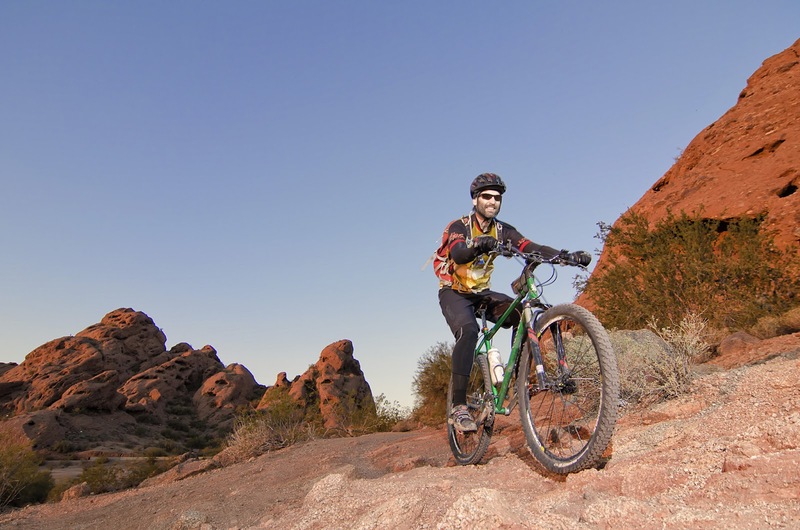 The Santa Rita foothills give way to fast flowy singletrack near the 14 mile mark. From there it was a mad dash with another rider from Colorado to the aid station. I tried to keep up with her, but those CO lungs kept pulling away. I met up with her at a gate with a few miles remaining to the aid stop and started off ahead of her. I know she could have passed me just before reaching Sahuarita Rd, but we arrived for the mini-pizzas together. One of the best parts of the day! Thanks SDMB! Hey, it's Jeff & Nancy hanging out at the aid station. Jeff gave me the impetus I needed: slam a beer, grab a mini-pizza and a few snacks before heading back out. I wouldn't see those two again until the end. I left the aid station solo, the CO rider split a few minutes before me & I figured I wouldn't catch her. 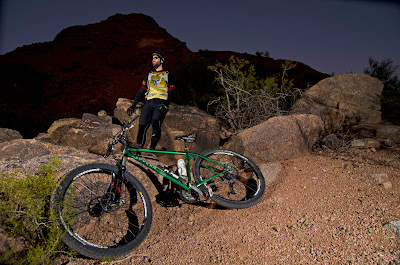 The trail down to I-10 is a hoot, followed by a nice piece overlooking a gorge. There's one sharp turn there I overshoot every time!! I was sure to take the high road at Three Bridges then back onto some twisting singletrack. Soon I starting seeing riders from the 10am shuttle and on one of the techy bits I caught up with Michelle, Tracy and Kathleen. I hung around at a goofy gate that was all knotted up with wire, helping a few riders get their bikes over when the CO rider came up from behind surprised to see me ahead of her!! 'Hey, how'd you get there?? ', she asked. I returned the same question followed by a 'you must have gone down under Three Bridges, huh?' Sure enough. She was gone after that until the finish. I heard a few of the 10am shuttlers mumbling about how they were not prepared for this kind of ride as they were HAB'ing up a short climb. The AZT will do that to people. I was cruising along, rose out of the saddle and my left quad just locked. Whoa, did that smart. I had to wait a minute or two before I could unclip, then just stood there for about 10 minutes waiting for it to release. I at least snapped a few pics. Cramp pic #2 with Mt. Lemmon in the background. Finally back riding, I only had about 4 miles to go and I was shooting for a sub 5:30 time, but that delay would cost me. The trail entered the land of the saguaro, flattened out and became really fast. I could see the cars at the parking area, but by the time I rolled in my time was 5:33 a little over a half-hour faster than last year. Funny thing is, my moving time from last year was faster, but this year I stopped a lot less. J-Bake, Donna & Krista are trying to keep warm during the post-ride festivities. Another year, another successful AZT Jamboree. If you find yourself in AZ in mid-January look this event up, I promise it won't be this cold next time!! A special thanks to Chad & Scott for helping to make this a reality. K and I had planned on doing our annual New Year's Day hike, but we didn't make it out that day. 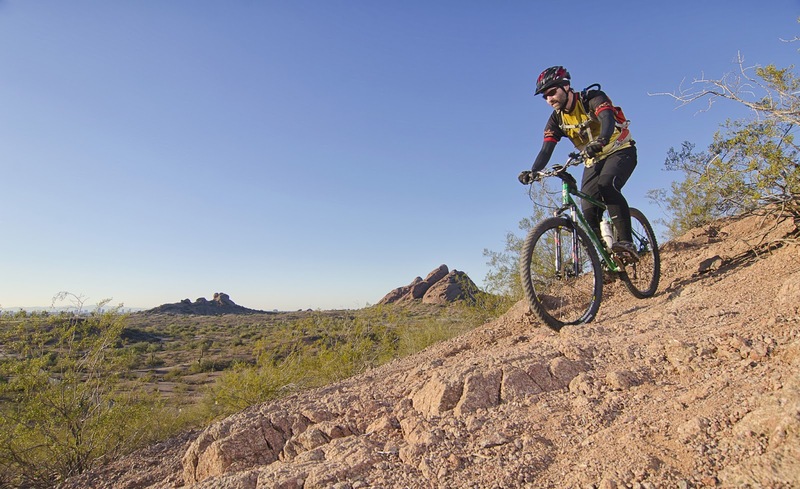 We made up for it the following weekend by exploring a couple of seldom used trails in the southwest corner of South Mountain Park. We started up the flat portion of the Pyramid Trail, then up a bit of the Ruins Trail until we spotted the faint beginnings of the Eliminator Trail. This trail makes no attempt to hide the fact that it rises sharply from the desert floor up to the spine of South Mountain where it connects to the west end of the National Trail. The views are stunning, but don't ogle while you walk! We past by a few mineshafts from years gone by, stopping to catch our breath. Near the top K was ready to head down the mountain, so we hung a right and skirted down the Lost Mine Trail to complete the loop. While on the two trails going up/down the mountain we saw about 6 people. It's a total of 5 miles from the Chandler Blvd trailhead with 1000' of gain. It'll make you sweat if you want it to. Not sure if I'd take my bike on either of them, but I know a few of my downhiller friends ride them. They weren't all that chunky, just steep/loose & sketchy in sections, just not my cup of tea. One of the handful of mines on our way up the mountain. Here's a nice view of the Bursera Trail, aka Bees Knees and the Gila Valley Trail below. Gila Valley Trail crests the saddle high above the ruins. On our way up Eliminator we can see our path downward on Lost Mine Trail. K starting to realize we're very close to the top. The top of Lost Mine looks innocent enough. At the junction with National Trail looking west. K deciding how to approach a sketchy loose section of trail. Lower Lost Mine Trail with the spine of Pyramid in the background. Look closely to spot the switchbacks on Pyramid Trail. A view of the switchbacks that we climbed on Eliminator. A rare sighting of lichen. Pyramid looms for another day. On the final piece of trail, clouds finally giving way. A fellow co-worker, An, is quite a phenomenal photographer. So when he asked me to be a subject for one of his projects, I couldn't refuse. His project: Photographing 10 active adults who are passionate about their sports. I sure fit the bill for mountain biking! We met after work one Friday in the late afternoon sun over at Papago Park in Phoenix. Papago just so happens to be the very first place I rode a mountain bike way back in 1994. I crashed pretty good that day,testing out my helmet. I was not deterred and quickly fell in love with the sport. We set up over by Hole-in-the-Rock for the first batch of pics, then moved over by the Amphitheater off of McDowell Rd for the rest. Thanks again An for the opportunity, they came out great!